Some ute owners are repeatedly returning to dealers for known mechanical faults. AUSTRALIA'S top-selling utes are repeatedly returning to dealers for known mechanical faults - but in most cases they won't be fixed unless customers complain. 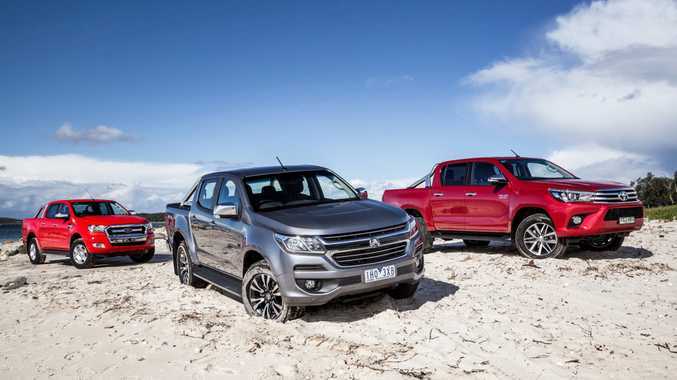 Confidential documents obtained by News Corp Australia show the Toyota HiLux is the subject of several running changes to address known faults that fall short of a safety recall. These include recurring problems with clogged diesel particulate filters (DPF) that cause the vehicles to blow "excessive white smoke from the exhaust pipe", air sensors that become contaminated with dust and trigger the car into "limp home" mode, and a transmission thump that has been traced to the drive shaft. Dealer sources say HiLux customers must bring their vehicles back three times for a DPF "re-gen" flush; only on the fourth visit will the DPF be replaced. The HiLux's latest diesel particulate filter fix is accompanied by a "reflash" of the engine management computer. Toyota dealers are also trying to repair faulty drive shafts - if customers complain - on the first visit by machining them. If the transmission thump continues, HiLux owners will get a new "rear propeller shaft slide joint", but only on the second visit back to the dealer. In a statement to News Corp, Toyota Australia apologised for the inconvenience to affected customers and confirmed the above technical issues are being addressed. The company urged owners who encounter these faults to "immediately contact their nearest dealer, who will investigate further and provide support and transport assistance as required". The Ford Ranger - the second best-seller behind the HiLux - is also far from fault-free. Ford has replaced complete engines in a number of near-new Ranger utes after News Corp Australia intervened on behalf of concerned owners. On certain Ranger utes there are also known faults with intercooler pipes splitting, rear main oil seals leaking and harsh transmission shifts, for which Ford has introduced running changes. Ford is yet to disclose the cause of the catastrophic engine failures, which were initially diagnosed as being caused by poor quality fuel. As with Toyota, however, only customers who complain get their vehicles fixed. 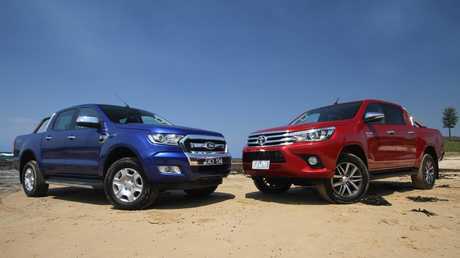 The Ford Ranger (left) and Toyota HiLux (right) both have their fair share of confidential dealer fixes. Picture: Joshua Dowling. The exception is a recall on certain Ford Ranger and Mazda BT-50 utes to fit a heat shield near the diesel particulate filter after 24 examples caught fire when driving over long grass. Ford and Mazda issued a safety warning even before they had the parts available, to notify owners of the danger heading into last summer. Both brands have since commenced recalls after notifying customers. Nissan dealers revealed the Navara ute can leak engine and transmission oil but say the problem isn't widespread. Holden service technicians say some Colorado utes use excessive oil and to date there is no fix. Isuzu owners have discovered cracks under the bonnet - near the suspension tower - in a number of current generation D-Max utes. Investigations are ongoing; some customers may be unaware of the potential flaw. As News Corp's motoring feature story reveals this week, there are widespread faults with most of Australia's top-selling brands. However the information is kept secret and next to impossible for potential buyers to discover without a friend in the trade. The car industry collects data on quality, reliability and faults to compare with rivals - but that information is not shared with the public, unlike in the US. Most brands won't release their internal quality figures, citing confidentiality agreements. Two brands in the Top 10 said they are open to the idea of opening their books - but will only share the comparative quality data if other manufacturers do so. Independent mechanics will soon get access to the same technical information as dealership workshops. Picture: Supplied. The ACCC has recommended that technical information should be more easily accessible to independent mechanics - including dealer service bulletins about known widespread faults. "Dealer service bulletins are shared with independent mechanics in Europe and North America and under the ACCC's recommendations the same data will soon be available here," says Stuart Charity, the executive director of the Australian Automotive Aftermarket Association, representing 20,000 independent repairers. 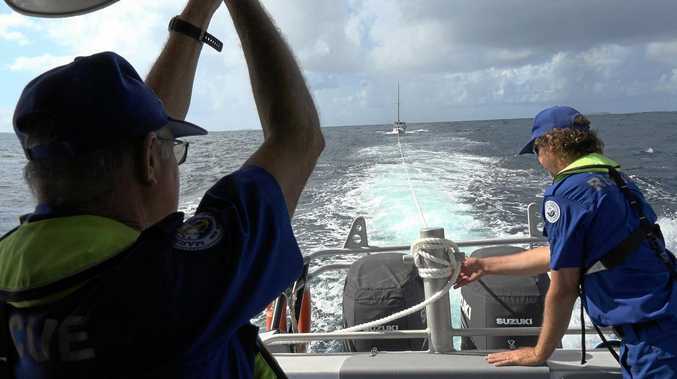 The Federal Government is currently working on the rollout of the mandatory shared technical information scheme, but is yet to announce when it will be introduced. "The sharing of technical service bulletins are essential to the scheme … these are known faults and fixes," says Mr Charity. "Independent repairers are currently spending hours trying to troubleshoot faults that the car company is already aware of." The AAAA says car owners are "entitled to know of any issues or defects with their vehicle". "Without this transperancy there's no incentive for car companies to improve their vehicles," he said. "Hopefully, car companies won't be able to hide this repair information in the near future." The ACCC has repeated its warnings to the car industry about consumer rights with faulty cars. Picture: Supplied. A statement from the ACCC said: "Vehicle manufacturers and dealers are reminded that consumers have rights to repair, replacement and refund under the Australian Consumer Law (ACL) consumer guarantees, depending on the nature of the fault. "For example, if a consumer's ute fails to meet the consumer guarantee of acceptable quality (including that it is safe, durable and free from defects), then the supplier that sold the car (e.g. the dealer) can choose to repair the defect - assuming the defect can be fixed or resolved within a reasonable time. "However, if such a repair is not done within a reasonable time, the consumer may request a free replacement ute, a refund, or seek a repair elsewhere and be able to recover the costs, as well as any 'reasonably foreseeable' loss or damage suffered as a result of the failure," the ACCC wrote.